Of the (approximately) four hundred thousand million stars in our Galaxy, more than half are not single stars like our Sun, but occur in binary or multiple systems. Binary star systems come in many flavours: red stars orbiting blue stars, huge stars orbiting tiny stars, black holes orbiting blue giants, red stars orbiting neutron stars, and so on. Here in the Astrophysics Group at MSSL, we are studying a particularly interesting group of binary stars: the Cataclysmic Variables (or CVs for short). In a CV binary, one star is a white dwarf: a collapsed star with the mass of the Sun in the volume of the Earth (our Sun will become a white dwarf in about four and a half billion years). The other star is a red dwarf rather like our Sun, but redder and less massive. The red dwarf and the white dwarf orbit each other once every few hours: they are so close together that the average CV system would fit comfortably into our Sun. When we observe CVs, we can't resolve the two stars: they appear on the sky as a point source. This is the reason that all the pictures on this page are artist's impressions: if we showed you a real picture of a CV, it would be rather boring. Oh all right, here's a picture of EX Dra, an eclipsing dwarf nova. The CV is indicated by the lines on either side of the stellar image. All the details in the pictures shown here have been deduced since the early 1950s when M.F. Walker proposed the binary nature of CVs. The CVs with accretion discs come in several flavours. The first to be discovered were the novae, originally novae stella: new stars. They draw attention to themselves by their stupendous amplitude of variation --- 6 to 19 magnitudes (that's factors of about 100 to several million in brightness) over a period of months or years. The novae with the largest outburst amplitudes fade the fastest. Nova outbursts are due to thermonuclear runaways of the hydrogen-rich material that has accreted onto the white dwarf. Most novae known have only been observed to undergo one nova outburst, but several are recurrent novae. The recurrent nova T Pyx is particularly interesting: it was recently observed to possess collimated jets emanating from the central regions of the accretion disc (Shahbaz et al. 1997, Astrophysical Journal, 484, 59). It is the first CV system in which jets have been observed. Another group of non-magnetic CVs is the dwarf novae. Their outbursts are not quite as spectacular as those of the novae (in outburst, dwarf novae are a mere factor of 6 to 100 brighter than in quiescence), but the outbursts occur more often. In general, the more frequent the outburst, the smaller the amplitude of outburst. Examples of the extremes of the dwarf nova phenomenon are V1159 Ori, which has outbursts once every four days with an amplitude of about two magnitudes; and WZ Sge, which shows outbursts once every thirty years, and the outburst ampitude rivals that of a classical nova outburst. Both these extremes of behaviour occur in the dwarf novae with the shortest orbital periods. 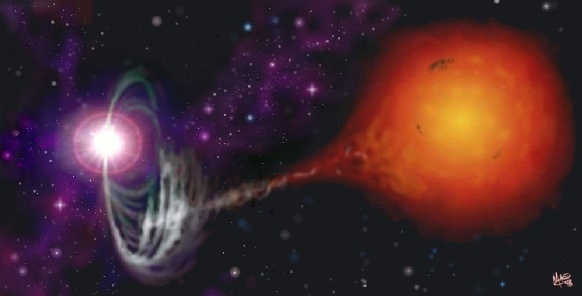 A dwarf nova outburst is thought to be a large release of gravitational potential energy caused by a temporary enhancement of the rate of mass transfer through the disc. During a superoutburst, a SU UMa star shows an additional modulation of the light curve, a superhump, which is caused by precession of the accretion disc. Superhumps show up in the light curve as a modulation with a period slightly longer (a few percent) than the orbital period. For some more excellent "footage" of superoutbursts and their accompanying superhumps, see the VSNET homepage. Another group of CVs with accretion discs are the nova-like variables. The difference between the nova-like variables and dwarf novae is that nova-like variables don't undergo dwarf nova outbursts. This is because the rate of transfer of matter in their discs is (by-and-large) stable, and the overall brightness varies only slightly about its mean level. In addition, the rate of mass transfer in the discs of nova-like variables is much higher than that in quiescent dwarf novae, and the accretion discs are thus very bright. The nova-likes with the highest mass transfer rates are the SW Sextantis stars. This intriguing group of stars has many unusual properties. For example, the emission lines in their spectra behave in an unexpected way. If you observe a CV system edge-on, so that your line of sight is along the plane of the disc, you expect to see double-peaked emission lines. This is because the gas in one half of the disc is moving towards you, and its emission is thus blue-shifted, while the gas in the other half is moving away from you, and its emission is red-shifted. Despite being edge-on systems, the SW Sextantis stars have single-peaked emission lines. For more details of the other weird properties of SW Sextantis stars, and some recent models that explain them, see e.g. Hellier (1996, Astrophysical Journal, 471, 949) and Dhillon, Marsh & Jones (1997, Monthly Notices of the Royal Astronomical Society). Some nova-like variables show superhumps, like those seen in the SU UMa stars in superoutburst. Unlike the superoutbursting systems, however, these nova-likes have superhumps in their light curves all the time. They are the permanent superhumpers. An interesting group of CV systems that show permanent superhumps is the AM Canum Venaticorum stars. They are helium-rich CVs: no hydrogen has ever been detected in any of them. They have much shorter orbital periods than the hydrogen-rich systems: the two stars of AM CVn itself whizz around each other every quarter of an hour. 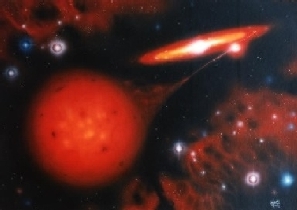 It seems that the two crucial criteria for a system to show superhumps are the following: first, there must be a high rate of mass transfer through the accretion disc; and secondly, the mass-donating red star must be much less massive than the accreting white dwarf (its mass should be no more than a quarter of the white dwarf's mass). Interestingly, the superhump phenomenon is not confined to CVs: they have also been observed in the weird neutron star binary SS433 and in black hole soft X-ray transients (see e.g. O'Donoghue & Charles, Monthly Notices of the Royal Astronomical Society, 282, 191). In the astrophysics group at MSSL, we are particularly interested in CV systems where the white dwarf has an appreciable magnetic field (several tens of millions of Gauss). Because the matter in the accretion stream is partially ionized, it can't form a disc (because charged particles can't cross field lines, only spiral around them). Instead, the gas is threaded onto the field lines and plunges straight down onto the magnetic poles of the white dwarf. Because the accretion occurs almost perpendicularly to the surface of the white dwarf, copious X-ray and EUVB emission is liberated at the poles. Many magnetic CVs were and continue to be discovered by X-ray satellites (e.g. ROSAT, ASCA, RXTE, BeppoSAX). We expect more to be discovered by the next generation of X-ray satellites such as AXAF, JET-X, and XMM. XMM -- the X-ray Multi-Mirror Mission -- promises to be a particularly useful observatory for magnetic CVs: it will enable simultaneous observations in the optical, ultra-violet, and X-rays. Multi-wavelength coverage is essential for discovering the energy distribution in CVs and other high-energy astrophysical sources. MSSL is involved with building two of the three instruments on XMM: the Optical Monitor, and the Reflection Grating Spectrometer. The XMM satellite is due for launch in 1999. Polars provide us with an ideal opportunity to study the interactions between high-density plasmas and very strong magnetic fields --- conditions that cannot be created in any terrestrial laboratory. Because the magnetic field of the white dwarf controls the flow of the gas from the companion star over large distances, we can observe aspects of the accretion flow that are absent or difficult to observe in other interacting binaries. The process whereby the accretion stream becomes coupled onto the magnetic field lines is very complex and difficult to approach from a theoretical point of view. Observations of the emission from the accretion stream can help to unravel the physical conditions there. One of the most distinctive properties of the light emitted by polars is that it is both linearly and circularly polarized (this is one of the reasons why polars are called polars. The other reason is that the name was recommended by the Polish astronomers Krzeminski & Serkowski). By observing changes in the intensity of polarized emission over time, we can discover the magnetic field strength of the white dwarf and the magnetic field geometry. This is an active field of research here at MSSL. Read more about polarization observations here. In the intermediate polars (which are thought to have lower magnetic fields than the polars), the spin period of the white dwarf is shorter than the orbital period. The accretion process in the intermediate polars is through a disc with a disrupted inner radius (where the magnetic field is powerful enough to influence the flow of the gas), or an accretion stream as in the polars, or either, or both (just to prevent you from falling asleep). The intermediate polars with the shortest spin periods are the DQ Herculis stars, of which two and a half are known (no, I'm serious. One star, V533 Herculis, showed the characteristic spin pulses of the white dwarf at 63 seconds in 1978 and 1980, but hasn't shown them since). New CV systems are being discovered all the time. To date, more than 200 systems have been identified. Each new member of the CV zoo presents us with new properties that add to our knowledge of the CV phenomenon. From radio to TeV gamma rays, cataclysmic variables continue to provide fascinating new areas of research. The most up-to-date catalogue of CVs, Low Mass X-ray Binaries and related objects, compiled by Hans Ritter and Ulrich Kolb, is now available. Visit the High Energy Astrophysics Learning Center at the High Energy Astrophysics Science Archive Research Center (HEASARC) to learn more about high-energy astrophysics and the satellites that are used to observe cosmic X-ray and gamma ray sources. For general information about the CV subtypes, read the introduction at VSNET. Long-term monitoring campaigns of many CVs are underway at the Centre for Backyard Astrophysics . Read more about Intermediate Polars at Koji Mukai's IP Home Page. Read about TOADS: the Tremendous Amplitude Dwarf Novae, at the International TOAD Watch homepage.